This Devil's Advocate intentionally takes the wrong side of some arguments. Can you spot the flaws in reasoning? When you buy go books or read go strategy on the internet, make sure to check they're for the rules that you will be playing. Trying to apply area scoring strategy to in a game that uses territory scoring can lead to grave mistakes! The creators of this page carelessly neglect to mention if area or territory scoring is used! Vincent: The idea behind this proverb is to maintain aji. It has nothing to do with prisoners. Fwiffo: I'm reminded of a riddle involving three sailors and a bellhop. Territory and area scoring (excluding a few exceptional circumstances like certain seki) produce the same result. costs black just one point with either set of rules. In territory scoring, it costs a point in the form of a prisoner, and in area scoring it's one point by virtue of having one less live stone on the board at the end of the game. Of course, the extra forcing moves that creates are presumably worth well more than that one point. 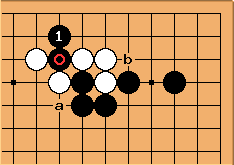 tapir: Black spends one stone, but still it does not cost anything, because White will have to spend one more stone than without extending to neutralise it (this is already +-0) and has to answer two useful Black moves from the outside at a and b because if Black does not extend it loses at least one of those moves. This outside moves are what the proverb is about.